My Italian lawnmower and I have a long and rich history together. But, I have to admit that I was ready to part ways when it’s tattered grass-catcher-bag snagged the top of the sprinkler head, shearing it off and subsequently chopping it into hundreds of tiny unrecognizable pieces scattered across the lawn. 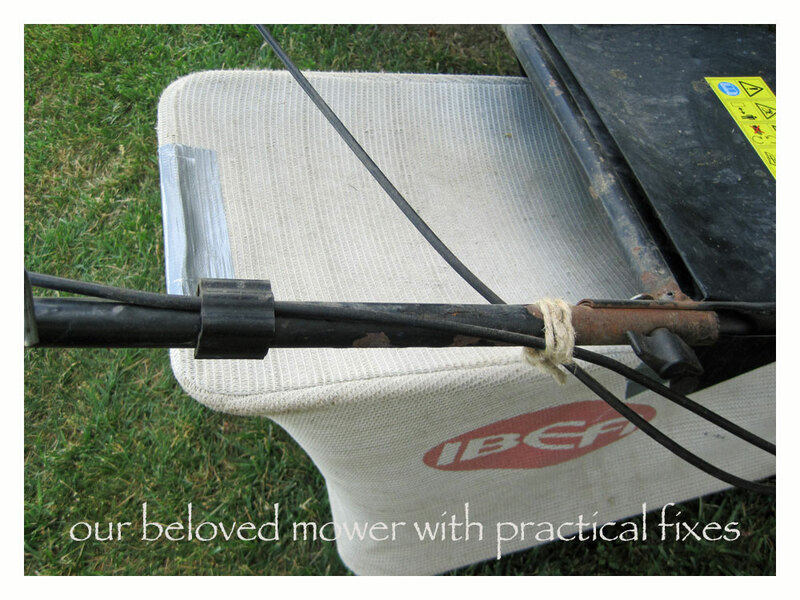 I was really angry with my favorite little IBEA push-mower and was forced to take a “time-out” to cool down a little. My grass-cutting woes were worn on my sleeve as I recounted the fateful incident to our friend Drew who was visiting for a few days. Coming to my rescue, he enthusiastically agreed to go with me to our local repair shop to see what could be done. I had pretty much already concluded that they wouldn’t be able to get a replacement catcher and that it was my golden opportunity to take my old tosaerba, lawnmower in and trade up—visions of a self-propelled model were secretly dancing in my head. My old dream was about to become reality. 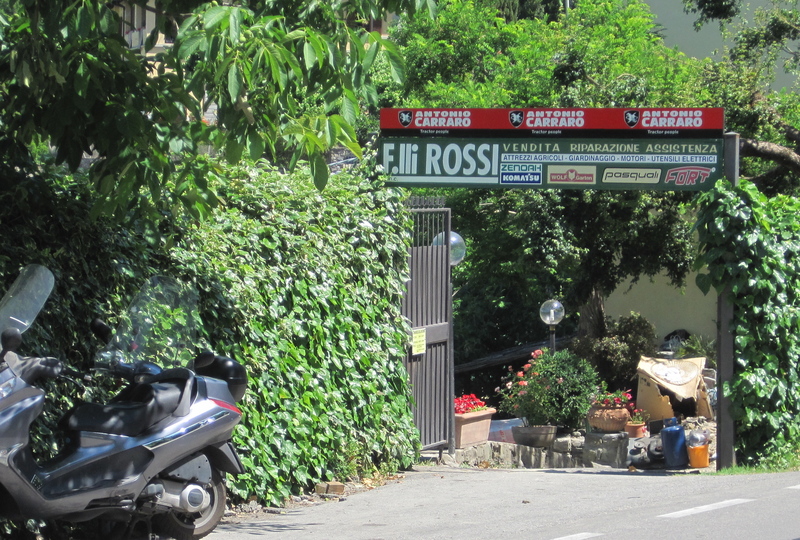 Three generations of the Rossi family run a sales and repair shop for everything outdoors and farmy. There’s always a string of work trucks and cars parked along the road, waiting on their owners who love to stop in and chew the fat about their farm implements. It’s a fun place to go. As you can see, I’m easily entertained. The nonno, grandfather was running the shop last Saturday afternoon, which really meant hanging out with his buddy from down the street, talking in the shade of the arbor out back. Drew and I sauntered down the terraced steps to describe our dilemma. He immediately asked me questions in Italian that I could neither understand nor answer, so I went back to the car to retrieve the grass catcher, my prime piece of evidence. Signor Rossi and his buddy hunkered over the sad looking grass bag and then back at me with challenging squinty eyes and a simple question: Why would you want to spend 20 Euro and wait 2 weeks when you can fix this today for free? I didn’t have a good answer, or the nerve to share my hidden agenda of swapping my old mower for a shiny self-propelled replacement model. Rossi coiled a length of copper wire around his hand and then offered it to me. From his gestures, I understood that with the copper I could sew the thing back together—good as new, and lookin’pretty snazzy to boot! As I cheerfully, yet reluctantly took the copper, I realized something: Italians seem to have this aversion to selling things. 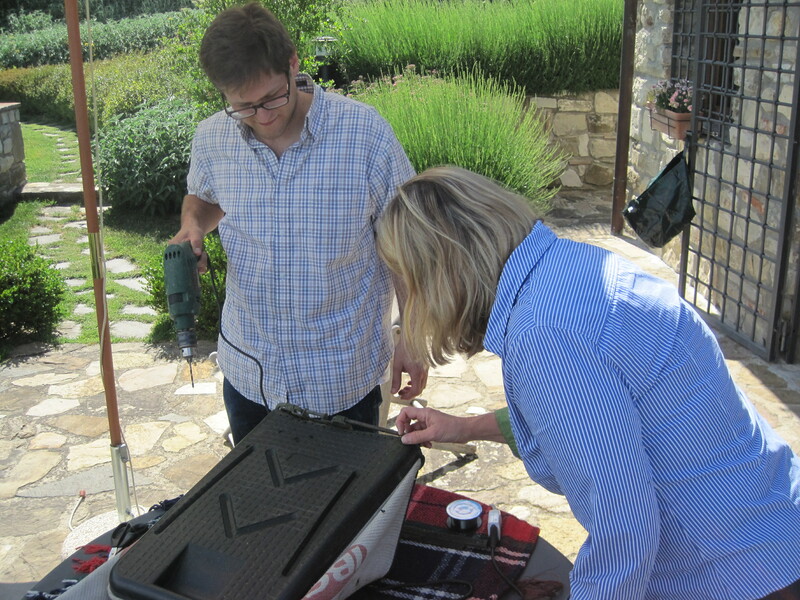 They’re fixers and tinkerers by nature, and so are much more practical and frugal than I am. They actually get a kick out of avoiding cost—at all costs. Well, you know the old saying—when in Rome . . . So logic would follow, when in Florence, do as the Florentines. When we pulled into the driveway, Cheryl was there waiting for us. We told her the news that the old IBEA was here to stay and that I was to become a seamster. 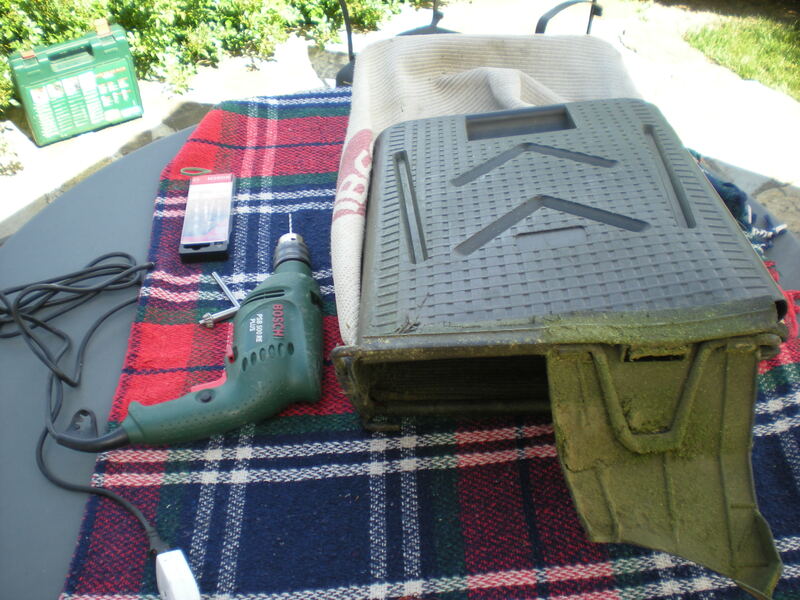 Rather than the proud owner of shiny new equipment, I would spend the pomeriggio, afternoon repairing the grass catcher. Since the task was definite, we decided to make it a team project. 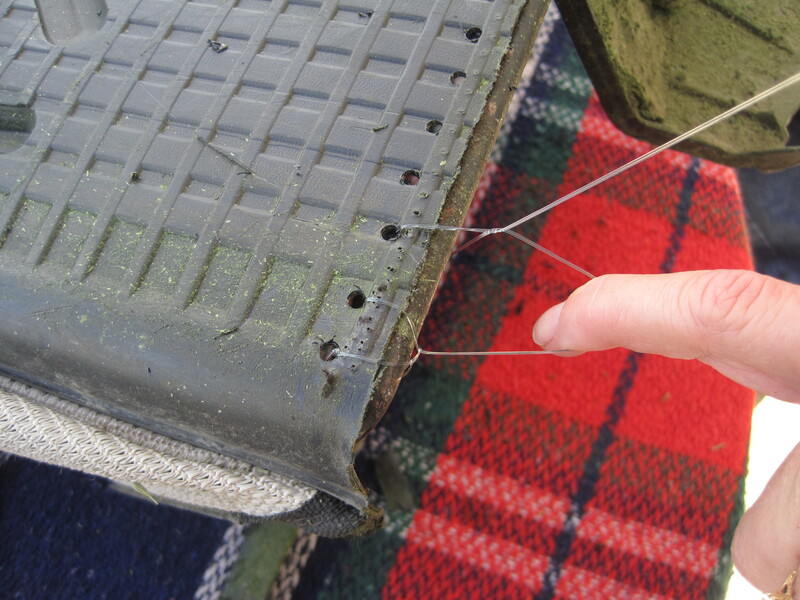 Within minutes, we had the protective plaid work blanket laid out on the patio table alongside the drill, needle and some lenza, fishing line. We decided that the copper wire was more vulnerable since we could break it simply by bending it back and forth a couple of times. With some of the best minds in all of Italy on my team, the promise of radical success was assured. Drew drilled holes in the rough plastic bag bottom every half-inch or so. Cheryl devised a beautiful blanket stitch technique that was pretty slick. It was fun watching that piece of trash turn into a darn nice looking mower accoutrement once again. We got so far into the spirit of renewal, that we went beyond the bare necessities to a few less than urgent improvements. 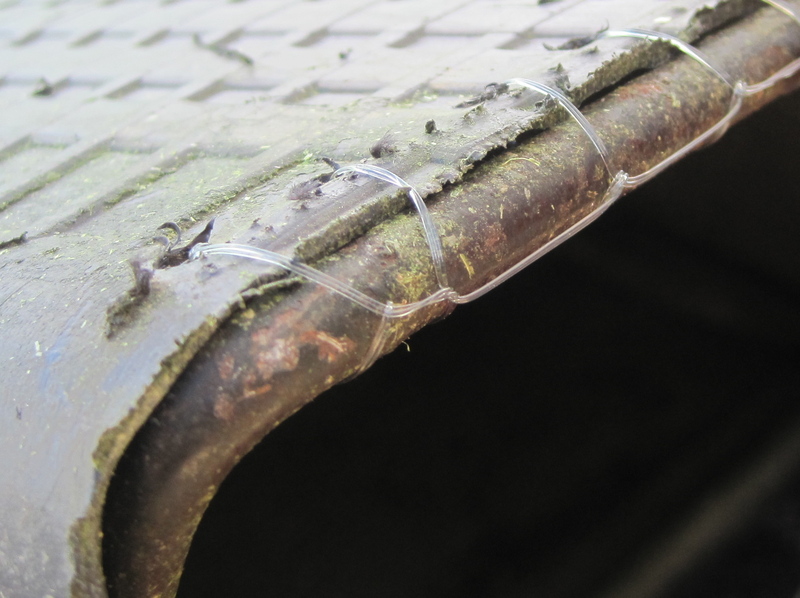 I stretch a line of duct tape over the holes in the fabric that had been blowing grass into my face. And presto! Like magic we were back in the mowing business without spending one centesimo rosso, red cent. Finished product – good as new! I learned a valuable lesson that day about creativity, resourcefulness and frugality. My “American consumer” training almost won out over the practical Italian contadina, farmer persona that lurks ever present in the psyche here. I think I’m finally catching on to this Tuscan idea. 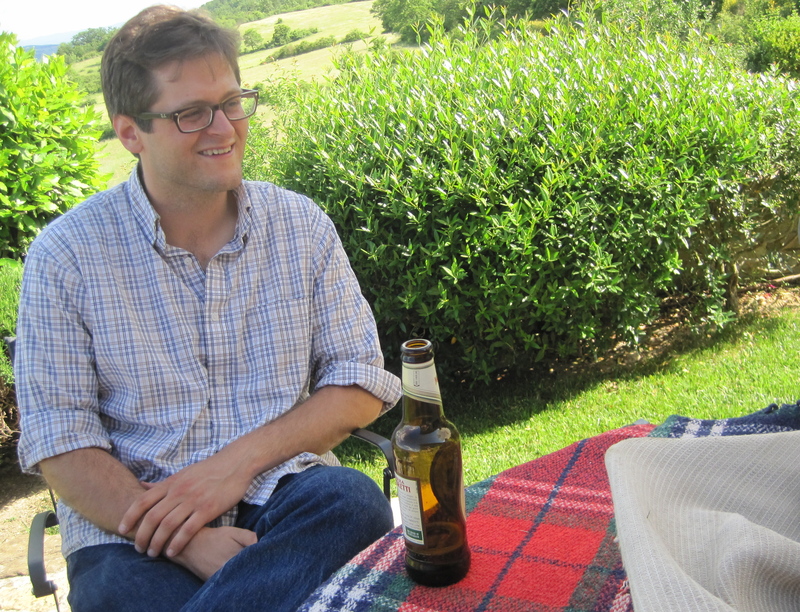 Over the past ten years in Italy, I’ve been lovingly blanketed by a very different way to live life. Slowly but surely, I’m changing, and I have to say that it’s a real stitch! Prev Post: Help Stamp Out Noise!